AMD has released Radeon ProRender for Blender 2.0, the latest update to the Blender edition of its free physically accurate GPU renderer, in open beta. The update rewrites the plugin to support Blender 2.80, and adds AMD’s new AI-driven denoising system, adaptive sampling and support for rendering hair. The 3ds Max and Maya editions of the renderer have also been updated, with the Maya edition getting support for Maya Fluids volumes and the XGen interactive grooming tools. All three updates were released at NAB 2019. The Blender plugin gets the largest update this time round, with a complete rewrite to support some of the new features in Blender 2.80, which is itself currently in beta. ProRender now supports the most commonly used Blender shader nodes, including the Principled shader, out of the box, although its own render nodes are still available for more “expert-level” set-ups. Viewport and final rendering performance have also been improved over the old Blender 2.79 plugin, although AMD doesn’t put a figure on the speed boost. Other changes include a new AI-driven render denoising system, which supplements AMD’s existing GPU denoising technology, introduced in the previous update. It’s currently only available in the Windows edition of the plugin, with Linux and macOS due “at a later date”. The update also adds support for adaptive sampling, focusing computational effort on the noisiest parts of a render; and for rendering Blender’s native hair material. The Maya plugin also gets AI-accelerated denoising, adaptive sampling and hair rendering – the latter supporting Maya’s XGen interactive grooming tools. In addition, it now supports Maya Fluids volumes, helping to render gaseous fluids like fog or smoke. As with Blender, AI denoising is only available in the Windows edition of the plugin; the remaining new features are available on Windows and macOS, though not currently on Linux. 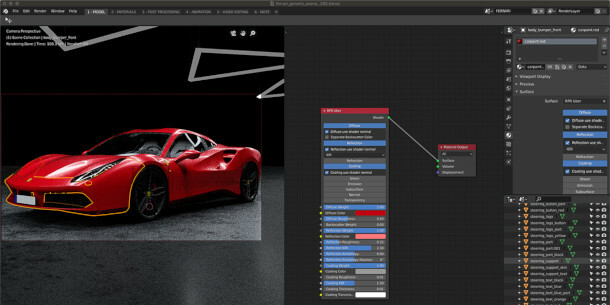 The 3ds Max plugin gets support for AI denoising and adaptive sampling, plus the option to convert Arnold or Redshift materials automatically to their ProRender equivalents. Radeon ProRender for 3ds Max 2.5 is compatible with 3ds Max 2017+, running on 64-bit Windows 7+. Radeon ProRender for Blender 2.0 is compatible with Blender 2.80 on Windows 7/10, Ubuntu 16.04/18.04 and macOS 10.13.3+. It is currently in open beta. Radeon ProRender for Maya 2.6 is compatible with Maya 2017+, running on Windows 7/10 and macOS 10.13.3+. The Linux version hasn’t been updated for some time now, and remains on version 2.1. The renderer is hardware-agnostic, but for GPU acceleration, AMD graphics cards are “recommended”. You can use any Intel or Nvidia card that supports OpenCL 1.2, but only on Windows 10 or Linux.